Samsung Electronics’ most anticipated launch of the year is here. The company unveiled its flagship smartphone of the year, Samsung Galaxy Note9 in an event, Samsung Unpacked in Brooklyn at New York on Aug 9. “Note fans are Samsung’s most loyal; we know they want it all, to get the most out of work and play, and Galaxy Note9 is the only phone that can keep up with their busy lives,” said DJ Koh, President, and CEO of IT & Mobile Communications Division, Samsung Electronics. Even before the official launch event, we had learned everything about the 2018 Samsung flagship smartphone, including its memory size, battery capacity, color options and display aspect. The Samsung Note series is known for its breakthrough innovation and premium architecture and Galaxy Note9 does not stay behind any Android flagship phones. Built on the framework of Galaxy Note8, the newest Samsung smartphone is designed to deliver more productivity and enhanced performance. Samsung ships Galaxy Note9 with a one of the largest screen size of 6.4-inch in Super AMOLED. The design presents an almost bezel-less metallic outer shell, giving a full-sized canvas to enjoy streamlined mobile experiences. The big display on the South Korean Electronics Company’s flagship smartphone is complemented by stereo speakers with Dolby Atmos audio system paired with AKG tuning. Samsung Galaxy Note9 is available in two configurations, 6GB RAM with 128 internal storage is the baseline model and the premium one gets 512GB storage space with 8GB RAM. The company skipped both 64GB and 256 GB Note9 variants as available in its predecessor. Both the Galaxy Note9 options support 512GB microSD, and this can increase the storage capacity of the 512GB Galaxy Note9 to 1TB. Whoops, that’s really huge and much desirable too! It eliminates a need to delete data every now and then and hence saving on time. The SD card slot can alternatively be used to insert a nano-SIM card in the phone. Featuring all-day long 4,000 mAh battery instead of the 3,300 mAh capacity available in Galaxy Note8, Samsung Galaxy Note9 runs on Android 8.1 Oreo. The big battery size, when coupled with the 10nm fast processor installed in the flagship smartphone support, sits high-performance capacity of day-long conversations, immersive gameplay, streaming audio/visual content and capturing memories with AI-enabled lenses. And the company’s engineer team also took care of concern related to the heat generated during long use of mobile and thereby developed a Samsung Carbon Water Cooling technology. Besides these, Samsung Galaxy Note9 is packed with standard Galaxy technologies such as fast wireless charging technology, water resistance and dust resistance properties, a headphone jack as well as services comprising Samsung Health and Samsung Pay. The latest premium Samsung smartphone includes Intelligent Scan verification system other than Iris, Fingerprint Facial Recognition Pattern, Pin and Password protection options previously available in Samsung Galaxy Note8. Other than the premium smartphone design, Samsung Galaxy Note9 S Pen serves more utility purposes. And this is one element that kept us engaged throughout 2018 Unpacked. Samsung has enhanced the functionality of the new Note9 S Pen leading to a boost in the productivity of Galaxy Note9. The user can write notes with the new S Pen on the flagship smartphone’s display during off-screen mode, a feature we saw in Samsung Galaxy Tab S4 also. The latest Samsung stylus is now integrated with Bluetooth Low-Energy (BLE)technology that facilitates converting the S Pen into a remote control to manage presentations when the phone is connected to bigger screens through pre-installed Samsung DeXsystem. Interestingly, Note9 S Pen also aids to click selfies if Galaxy Note9 is placed within a distance of 10 meters. The PENUP-powered Live Drawing and Photo Drawing software, meanwhile, present users easy tools to demonstrate their creativity through vivid artwork. And yes, the new Samsung stylus is not a tall battery-powered. 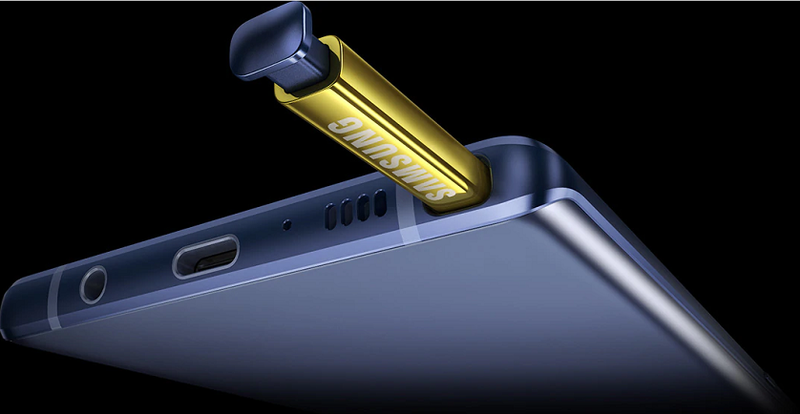 The S Pen’s supercapacitor gets charged simply by pushing it inside the main body of Galaxy Note9. Samsung incorporated Galaxy S9 Plus’ lens technology on this year’s flagship smartphone. Galaxy Note9 contains world-class Intelligent Camera technology to capture the best shots. The artificial intelligence-powered Scene Optimizer and Flaw Detection software placed inside the flagship smartphone’s camera give outcomes equivalent to an advanced big camera. The Scene Optimizer function employs deep learning technology and discovers which kind of scene is being captured. It can identify the categories ranging from food, flowers, and leaf to landscape and indoor shoots. The technology is smart enough to combine the object, time frame, and background elements and balance color tones accordingly. On the other hand, Flaw Detection function alerts the photographer if the shot is being ruined by an eye blink, a blur on the lens or harsh lighting. 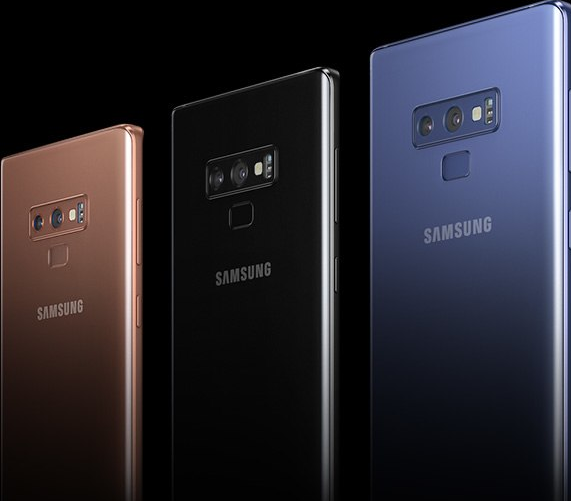 The Galaxy Note9 is offered in four vibrant color schemes – Midnight Black, Metallic Copper, and Lavender Purple with color coordinated S Pen and Ocean Blue with a contrasting Yellow color S Pen. Samsung dared to place the new Galaxy Note9 at par with iPhone X, at least in the price segment, which is $999 for 6GB RAM/128 GB model. The premium smartphone variant falls in the price range of $1,250. Pre-orders of Samsung Galaxy Note9 have begun from today and the device will be available from August 24, 2018, in the select market.